The Wachowski siblings originally shocked the world with The Matrix, an incredibly ambitious and important action movie from 1999. The latter two movies were absurd, rhetoric nonsense that completely diminished the love most people had towards that original Matrix movie. It’s funny how Cloud Atlas is mainly about lives being cyclical and all past mistakes will repeat themselves throughout history, because Cloud Atlas is also absurd, rhetoric nonsense by the Wachowski siblings. Cloud Atlas is based on a novel by David Mitchell, which tells six interwoven stories all linked by fate. When this book was originally pitched to Hollywood, many deemed it unfilmable and, frankly, they were correct. 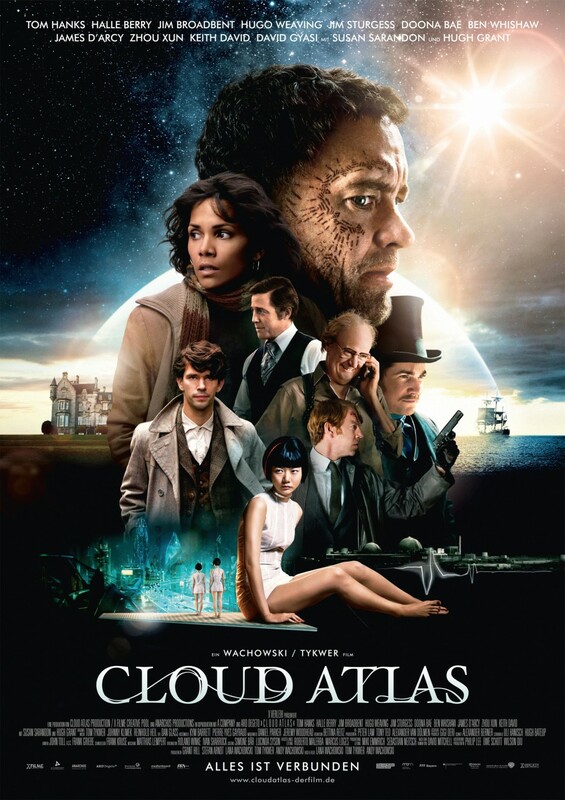 If anything Cloud Atlas isn’t one movie, it is six tedious stories tied together under the films main themes of the cyclical nature of humans. You never get enough screen time with any one story to end up caring about anything but the MacGuffin of it all: when will they repeat the same thing that was repeated in another life and will be repeated again? The script meanders through all six stories without any causal links between them. In one moment viewers are experiencing a 1970’s detective story in San Francisco starring Halle Berry. Not three minutes later, viewers are whisked away on a high seas adventure with Jim Sturgess. Right after that the movie switches to a post-apocalyptic future with Tom Hanks. Intertwined with that, and broken in at random intervals, is a ridiculous futuristic action movie that seems to be the major crux of the entire script. There is never a logical jump between stories; instead they just decide here’s a good time to see Hugo Weaving as a lady nurse in an retirement home. I can hand it to the screenwriters for at least never going so far off the deep end that I got lost in the sea of characters they unveil. Instead, because the story goes absolutely nowhere as a whole, I just think of it as really short, really annoying scene transitions. But it only comes across as a series of shallow vignettes. The cinematography of Cloud Atlas seems to be the only consistently decent thing in the film. Multiple times shots are lined up to mirror that of another in a previous time, to mesh with the films major themes. However, the visual story telling never goes as far as it can to bring something new or interesting to the table. The cinematography, much like everything else in the film, ultimately tries too hard to do anything more than tell a bland story. Each story has a unique look to match the era they belong in, but only on a surface level. During the future scenes with Doona Bae as Sonmi-451, all the characters of the story are seen of the Asian race, instead of their own. This leads to, what some might say, some of the most egregious and terribly offensive uses of makeup in years. Apparently, all it takes to make someone Asian is to pull back and tighten their eyes while adding a bit of powder to their face. I completely understand the point behind having the actors continue to play the parts they’ve had throughout the rest of the movie, but it actually made me uncomfortable to watch. Maybe if the makeup went further than just stretching their eyes, it wouldn’t be something I have to call out in my review. With such extreme time jumps, the actors never seem to grasp the ideas and motivations behind the characters they play. Accents come and go as the actors please so one minute Tom Hanks is talking like a pirate and the next he’s Scottish. Halle Barry also has trouble keeping her accent together and sometimes slips into a slightly hispanic accent. All of this ultimately leads to flat, soulless acting to match the flat, soulless script they had to work with. Everyone in the film has done far better work than this and it pains me to watch talent being squandered. The final twenty minutes of the film turned into a very unconventional comedy as all the major stories come to an end and you see all the different ridiculous incarnations of each person. I watch a lot of terrible TV and movies. Some would say I waste my life doing it. But I never thought it was a waste, really, mostly because I was having fun with it. After Cloud Atlas I now have wasted three hours of my life that I can never, ever get back. With such bad acting, makeup, and an absolutely terrible script above all else, this is one movie I cannot recommend that anyone see. Good review Clint. Not the perfect flick some people have made it out to be, but still a pretty entertaining and interesting piece of work.